This fantastic sweet pickle recipe was shared with me by my friend, Andra Cook of Raleigh, North Carolina. The Craven County Sweet Pickle recipes has become a very popular recipe with cooks coming to my web site. Since I get many questions on this recipe, Andra has graciously updated and added some comments on making these wonderful sweet pickles. This recipe was shared with me by my friend, Andra Cook of Raleigh, North Carolina. The recipe also appears in our cookbook called What’s Cooking America which was co-authored by Andra. I have made many pickled cucumber recipes with different types of cucumbers. This refrigerator version is the one our family loves. Not only are the cucumber pickles beautiful, but they hold up well in the refrigerator for a long time. The cucumbers stay crisp and they get better tasting every day. This recipe does not require a water bath. Make sure the jars seal properly. If one does not seal, put it into the refrigerator. It will still pickle within two weeks. Use within two months. Since I, personally, don’t like to take the time to process and can vegetables, I always want to either refrigerate or freeze them. his is a very easy and delicious way to make pickled beets. My husband loves them! This recipe is from my mother, Dorothy Hagerman. My mother used to make these every year when fresh beets were in the garden. They are a favorite of my husband. This recipe and photo were shared with me by Karen Calanchini of Redding, California. Karen says that this is an old Portuguese recipe that her grandparents and mother used to make when fresh beets were in the garden. They took fresh beets from the garden and whatever amount they gathered they processed. There really is no actual recipe, as you use how many beets you have harvested. I can never get enough of salsa and tortilla chips to snack on when I need that salt fix. I really love a good pico de gallo recipe so I thought I would use cucumbers instead of tomatoes to make this version of cucumber salsa with all the other pico de gallo ingredients I love! Double this recipe if you want to make a larger batch to bring to a party. These dainty peeled cucumber cups look wonderful, plus they are very-easy-make. The cucumber rounds provide the perfect base for all manner of tasty fillings to serve your guests as either an appetizer or for an afternoon tea party. Cucumber cups make a very easy and elegant way to serve this smoked salmon. Many spas serve fancy waters like these, and it turns out that Infused Waters or Spa Waters are so simple to make, plus they are so refreshing! Try this delicious and healthy Cucumber, Lavender, and Mint Infused Water. It’s a light, fresh-tasting water that goes great anytime of the day, and any time of the year. My daughters came across this unique and very refreshing agua fresca flavor combination at a local farmer’s market food booth this weekend. This drink really hit the spot while they were standing out in the hot sun, and my grandsons were also fighting over this drink! This healthy and refreshing salad pairs well with any spicy dish. It is also perfect for a light lunch served over cottage cheese. Growing up as a little girl, I remember my Grandma Meyers fixing chopped salad for all of the younger kids. It is a great trick to introduce small children to salad since the pieces are chopped up so small. Chopped green salads are so very simple to make and very delicious! What is a chopped salad? It is a salad where all the ingredients have been chopped to a fairly uniform size. 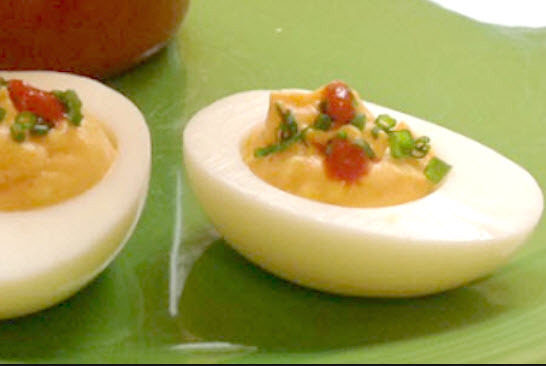 This makes a wonderful appetizer to serve your guests. A very refreshing and easy-to-make cucumber salad. You can use it with fish, chicken, or as a side dish by itself. It’s great to use during anytime of the year. This Cucumber and Strawberry salad is as delicious as it is beautiful! Surprise you family and friends with this delightful and very easy-to-make summer salad. This recipe is by Chef Wolfgang Puck, owner and chef of Spago Restaurant, Beverly Hills, California. This salad has a wonderful crisp taste and a slight Asian flavor. You can use it with fish, chicken, or as a side dish by itself. It’s great to use during anytime of the year. A new variation on a traditional cucumber tea sandwich! A traditional tea sandwich that is always a favorite! A very gourmet sauce that goes well with either smoked or baked salmon. This delicious Cucumber Sauce recipe and photo were shared with my by Karen Calanchini, Food Stylist and Photographer, of Redding, CA. Karen like to serve this sauce with herGreek Chicken with Cucumber Sauce and Orzo Salad. This very unusual Dill Pickle Soup tastes fantastic! It always surprises my guests when they discover that it has dill pickles in it. Excellent for a dinner party to give your meal a spectacular start. I’ve used this wonderful soup in several of my dinner party menus. Try it – you’ll like it! I am a huge fan of Gazpacho soup in the summertime which is a cold tomato-based raw vegetable soup. I also love Salsa Verde and cucumbers, so I decided to change up the ingredients for traditional gazpacho and make a tomatillo-cucumber version. This resulted in a very tasty and refreshing summer soup to keep cool during the hot summer evening. Top the soup with shrimp and fresh mozzarella cheese and you have a nice light dinner. My husband gave this soup a big thumbs up!